Ladies and gentleman, from the makers of the famed Titan Poker comes an online casino platform of majestic proportions – the all new Titan Casino! Titan Casino is a casino whose highly credible online "persona" well reflects its high ranking and reputation in the online casino industry. With this reputation built on its strengths in customer service and high quality gaming, Titan casino is certainly one which has earned its status as one of the main players around! The top quality gaming experience, of which Titan is rightfully proud, is facilitated by the expertise and innovation of Playtech software, whilst all games available throughout the casino are fully tested by the Technical Systems Testing North (TST) so that customers can be assured of both the games' fairness and Titan Casino's own fair gaming policy. Titan's customer-friendly approach includes fully inclusive promotions and very good communication with its online community of players. This is facilitated by their on-line blog and membership communication systems through individual accounts and their security assurances, as of course this is an issue for many online casino players. This assurance extends to that important download, for the full play of all games and their features, but of course gaming is also available in the form of instant Flash games across the casino. Titan Casino's virtual lobby is a striking combination of steely blues and greys, with a city skyline that reflects a combination of the strength in the original meaning of 'Titan' with the cosmopolitan allure of casino play. The blues and starry skyline offer an additional nocturnal ambiance that's also very fitting for casino play! Graphics and banners are plentiful and all link appropriately and quickly to their designated areas, making the site quick to navigate and very user-friendly. The site offers over one hundred games, all of which can be accessed via links on the main page. 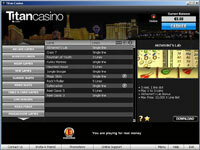 Prospective members can also access Titan's useful "Preview games" section, which details the range of games available and offers impressive screen shots of action from their wide selection of games, including card and table games, arcade game favourites, slots, progressive games, video poker, live casino games and Titan's own exclusive games! Titan Casino offers a mighty range of classic casino games, including Baccarat, Roulette, Blackjack, craps and other table and card games. There are live casino games as well within download mode, which opens up a wealth of fully interactive table play options alongside friendly Titan team dealers. As well as their preview option, Titan's main lobby is also linked to a "Players Guide" of games information, to help highlight new games to customers, or allow new customers become familiar with the rules and routines of casino play! Titan's slots lobby is seriously impressive and includes everything a slot lover could wish for. For starters, there are arcade games such as Jackpot Darts to Bonus Bowling, then of course there are those fantastic slots which combine all the strategy of poker play with the random fun of slots: Video Poker, which are popular payers across Titan! There is a 'reel' range of spinning options and formats too: from classic arcade three reelers to up to the minute sleek nine reel plus slots. These multi-spinners are traditional big payers at Titan, as you would expect when there are so many possible paylines too! For colourful, highly enticing graphic play, Titan is the one-stop needed to meet all slot players' needs. Recent new arrivals include Dolphin Reef, Arctic Treasure, Knock Out, that Marvel classic: The Incredible Hulk, Irish Luck, Joker Poker and Panther Moon: all of the latest titles that are not only big on the casino scene but also innovative in their own individual way, with feature games within games, plus free spin and big win opportunities! Progressives are always a draw in online casinos, so of course Titan does include plenty of progressives in its slots lobby, including the sought-after Marvel slots, Gold Rally, Beach Life and Mega Slots. However, the option of big jackpot wins isn't limited to these slots alone! Titan's poker video slots also feature among the big-payers, with payouts sometimes exceeding those standards progressive pots. It's a great opportunity for those poker players to have a bite at that progressive cherry through games such as Blackjack Pro, Caribbean Poker, Mega Jacks and the fun Jacks or Better progressive slot: 10 Line Jacks! Welcome bonuses are of course available at Titan and assure new members of a mighty welcome, across that first deposit and indeed beyond. There's also a no-pay start up available too, which again indicates the emphasis Titan puts on customer enjoyment of quality gaming. The importance of this community feel is also demonstrated in Titan's great "Refer A Friend" bonus promotion. Deposit options generally bring with them a range of bonuses at Titan. Many of the main funding formats are accepted, including Visa, Mastercard, Maestro, Moneybookers, Instadebit and Neteller, plus at least another fifteen options! Currency of GBP, USD and EUR is accepted and for the most part the minimum deposit is $20, £20 or €20 for most of the mainstream banking options. Online security is paramount to Titan Casino and all information and transactions follow stringent security procedures and are protected by top of the range firewall safeguarding. Finally, Titan Casino's support team are on hand any hour of day or night to assist with any and all member queries quickly and confidentially. They are accessible via onscreen tabs offering a range of telephone and internet contacts, as well as a useful list of frequently asked questions, to fully complement Titan's very pro-active attitude to customer care.